I really need to replenish my stash. It's down to just one KitKat (Yakiimo). This weekend, I had wanted to go to Toronto for a little shopping, but various parties and gatherings kept us in town. The weekend was fun, anyhow, but my candy supply is in critical condition. 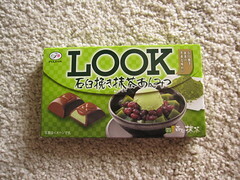 This flavor of LOOK is Millstone Ground Matcha Anmitsu. I'll just take them for their word on the millstone ground bit, but anmitsu is a Japanese dessert made with jelly cubes, sweet red beans, black sugar syrup, and in this case, matcha. Everything is better with matcha. The pieces just smelled like milk chocolate. 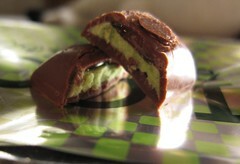 Inside the shell, the matcha filling was creamy with small, grainy, millstone ground bits that melted smoothly. The flavor was a bit bitter and grassy, but it was very mild. 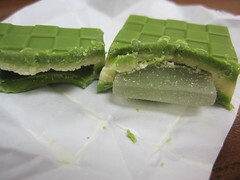 Above the matcha filling was a thin layer of anmitsu, which was just slightly bitter with a hint of azuki flavor (only detectable when the syrup is tasted alone). The milk chocolate was sticky, but the sweetness balanced the mildly bitter flavors nicely. I liked the grainy to smooth texture of the filling, but it would have been interesting to see some of the jelly texture brought in (I suppose that's best left to Tirol). It's hard to recreate the marriage of tastes and textures that is anmitsu. Matcha Anmitsu LOOK was pleasant, but the flavors, especially the matcha, just weren't strong enough to wow me. 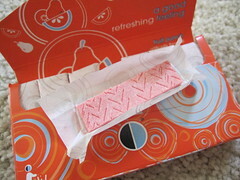 Ah, Orbit gum. It's been a while, old friend. While waiting to check out at my local Target, I spied Fruit Punch during my routine impulse candy scan. 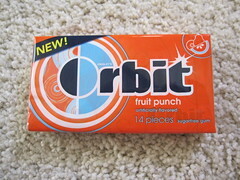 I've been off gum for a while, but a new Orbit flavor is always a good excuse to start chewing again. Fruit Punch is a very nostalgic scent and flavor for me. I used to use Bonne Bell Fruit Punch Lip Smackers lip balm every day in middle school, and that red smell is permanently buried in my nose. Even though it made my mouth feel fuzzy (probably from excess vitamin C), I went through a Hawaiian Punch phase at about the same time. These are my fruit punch memories, and I drew upon them to review Orbit Fruit Punch. Maybe it was a bad idea to hope this gum would taste like Hawaiian Punch. It wasn't even close. The gum smelled sweet and a bit like strawberries. The flavor was slightly tart and fruity. I picked out banana and peach, but anything else was lost in an indistinguishable blend. It wasn't bad, it just wasn't fruit punch. It didn't taste punchy (or like red food dye) at all. That's probably a good thing, because Hawaiian Punch is not a flavor that occurs in nature, but I wanted that flavor. Orbit Fruit Punch felt very subdued in comparison, and I was disappointed. Rest assured that there was no mint here, just a slight cooling sensation for that fresh feeling Orbit advertises. I chewed for about 15 minutes before the flavor dulled and I got sick of it. Mon Cheri is the lofty standard to which I compare all liquor candies. Nothing came close to that intense shot of filling...until now. 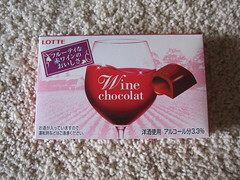 Lotte's Wine Chocolat was a last minute addition to my most recent napaJapan order, but it blew me away. With the pink background, sparkly glass of wine, and cute font, the packaging is clearly appealing to a certain type (myself included), but it came up short of the elegant look I think Lotte was going for. The chocolate contains 3.3% alcohol, and the package also reminds consumers to use discretion about driving. The format was quite similar to Mon Cheri, only on a smaller scale. The milk chocolate shell had a mildly sweet milky flavor, but it was almost irrelevant; the filling was most definitely the star of the show. The liquid center tasted strongly of sweet, brandy-like liquor. 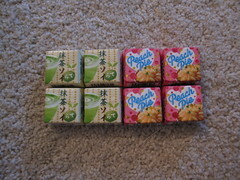 The filling had a slightly fruity flavor that reminded me most of cherries. 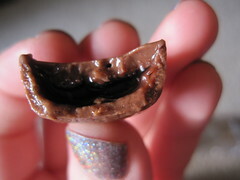 It was sharp on the tongue and went well with the smooth chocolate. It was a bit on the sweeter side, but that boozy kick was a fantastic surprise! 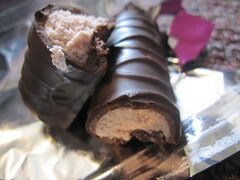 For today's review, I have some chocolate from the across the Atlantic (or the Pacific, if you take the long way). After returning from her most recent visit to her hometown in the United Kingdom, my boss kindly brought two chocolate bars that aren't available in the United States for me to try. It's such a treat to try candy from other countries - even when the flavors are familiar, the textures are often quite different! 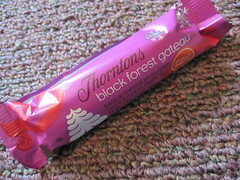 First up is the Thorntons Black Forest Gateau bar. Cherry/chocolate combinations have grown on me in recent years - I never liked them as a child. Even now, I have some texture issues with maraschino cherries (I don't like chocolate covered cherries at all), but thankfully, I had no texture qualms here. The bar had a very thick double chocolate coating of milk enrobed in dark, which is something I don't see often. It smelled mildly of cherry, and reminded me of a 3 Musketeers bar when I cut into it. 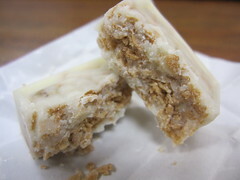 The filling, however, was much smoother than 3 Musketeers; it melted in my mouth and, in combination with the chocolate coating, had almost a velvety feel. The tart cherry zing reminded me of chocolate covered cherries (in a good way), which went especially well with slightly fruity dark chocolate. Excluding gourmet products, British chocolate often seems smoother and a bit richer than American chocolate, and this bar was no exception. It wasn't too sweet, and I really enjoyed the cherry flavor. It's worth noting that my husband, a chocolate covered cherry lover, found the flavor to be a bit artificial, but it didn't bother me. It's no secret that mango and matcha my flavors. I'm not picky, but I won't go out of my way to buy just anything. When it comes to desserts (or any food, really), if matcha or mango is an option, the odds are quite good that I'm going to pick one of those. So, it should come as no surprise that my latest order from napaJapan included both matcha and this Meiji Mango Chocolate bar. 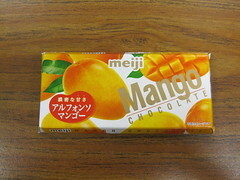 I've enjoyed similar Meiji strawberry and blueberry bars in the past, so I felt pretty confident that the mango would be tasty. The bar was thin and smelled of milk chocolate and tart mango. From the first bite, I was very impressed. The mango flavor was incredibly authentic! Just below the thin chocolate coating, the filling was tangy and had a texture reminiscent of real fruit (maybe from "mango powder" listed on the ingredients). 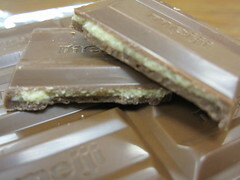 The slightly sweet milk chocolate was just right, and the size of the bar made it a delightful, light treat. It was sweet, a bit sour, rich, and unquestionably mango. This isn't a gourmet bar by any means, but it was delicious, and definitely one of my favorite products of the year!